This species is among Trinidad and Tobago’s most glamorous and colourful forest birds. It is the most common of the three native Trogon species, all of which inhabit forest areas. It is always a bonus sighting, as in spite of their vivid appearance they remain very reclusive. 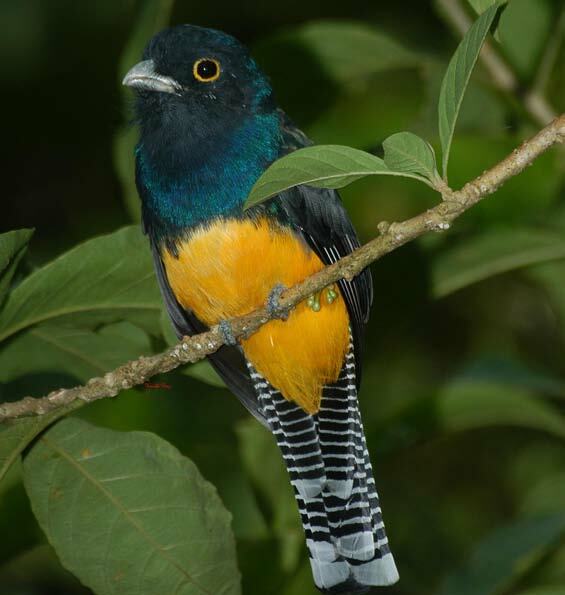 In fact, most Trogon sightings are made when attention is given to their shallow/low monotonous call which can easily blend into the sounds of the forest while they sit inactive and hidden within the sub-canopy (mid-forest); otherwise they go unnoticed. Formerly known as the Violaceous Trogon, the Guianan Trogon is a featured bird sought by amateur and professional bird-watchers alike, all impressed with its fascinating coloration and profile which is similar to that of its more popular and adorned Central American cousin, the Resplendent Quetzal. Trogons of all types demonstrate the peculiar behaviour of nesting within the arboreal nests of selected termites and ant species which provide some protection and incubation to the eggs. In addition, during the nesting period both male and female adult birds can be observed taking turns carving into Azteca Ant nests where they allow the ants to release “formic acid” about their bodies. This peculiar behaviour is called “anting” and is interpreted to be a way for the birds to get rid of feather mites, although some experts also believe that the Trogon gains some physical enjoyment from the experience. Regardless of your interpretation of this behaviour, the Guianan Trogon is always worth the trip into the forest, and this is another great reason to come to visit the Centre! Come take a look!